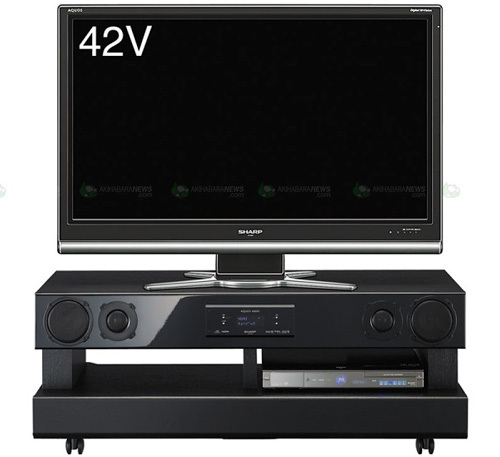 Sharp Aquos AN-ACD2 Home Theater Stand | OhGizmo! For serious home theater enthusiasts who are seriously lacking in space comes the AN-ACD2 from Sharp. Designed to be used with a 37 inch or 42 inch Sharp Aquos display (I’m sure a 32 inch would work just as well) the stand includes built in speakers and a sub woofer that when combined produce 150W of audio enjoyment. There are also two bays for adding your hi-def DVD player of choice, or a gaming console if you prefer not to dive into that mess just yet. It should be available next month in Japan at least, for about $866. ← [NAIAS 2008] Dodge Avenger Stormtrooper – Is This What Vader Drives?